I cautiously celebrate the UN approach as a crucial element (one among many) of refugee governance. It’s important to understand that refugees have more dimensions than that of being displaced (forced) from their homes; they have agency, worldly knowledge, skills. In my initial look at the photographs of the Dani, I thought these too were about nuancing otherwise stereotyped people. But text such as “Last of…”, “abandon traditions”, “Stone Age” and “cannibalism” still capitalize on shock, exoticism and apparent innocence, dependence. ‘They’ are certainly not the ‘last’ of their kind: that language is a dangerous relic of salvage-ethnography. I hoped the mix of ‘old’ & ‘new’ in the photos would be treated as a sign of resilience, resourcefulness and engagement with a globalized world; a sign of vibrancy and continuation of their culture despite attempts at forced assimilation. While I’m not diminishing the real harms done by political and social systems enforced on them, the use of ‘modern’ items do not signify ‘loss of culture’ or dependence on westerners (e.g., tourists). The irony of the elders using Spiderman and Angry Birds branded items may not actually have gone unnoticed by the people using these items, but in the context of this article they play up western notions of infantilism ascribed to subaltern populations and that have been perpetuated over the past 150 years of photography. Maybe the Dani (or some of them) really do feel that the licensed products spell an end for their culture, and that they feel like children in the grand scheme of geopolitical wranglings, but we don’t know. 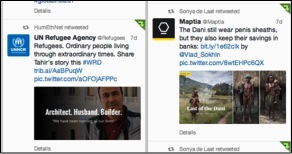 The UN tweet – even though still moderated by the UN – links to the ‘voice’ of Tahir, a refugee. There is no voice of any of the Dani. One wonders what story they would have told of themselves had they had their druthers.